Providing the finest in luxury and custom eyewear for more than 100 years. 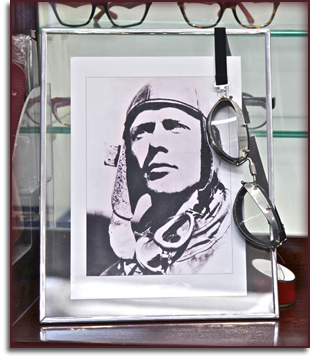 Teddy Roosevelt, Amelia Earhart, and Charles Lindbergh are among the noteworthy clients that E.B. Meyrowitz & Dell has been crafting “made-to-measure” frames for since 1875. Today, be it in their New York, London or Paris shops, one can still be fitted for a pair of the same classy, high quality spectacles. At our Manhattan practice, steps from both Times Square and Bryant Park. E. B. Meyrowitz is renowned throughout the world for our professionalism and craftsmanship since 1875, Patient satisfaction is guaranteed. Our staff is caring, professional, and friendly. We were the first opticians in the United States to fit Varilux progressive lenses. We have a full service lab on premise with the latest, most technologically advanced edging and finishing equipment. See the future of eye exams today. After having my progressive bifocals redone twice at Cohen's, I still couldn't see very well. My ophthalmologist suggested I go here, and what a HUGE difference. They recommended Zeiss Individuals, and took a series of precise digital measurements for them. The improvement in my vision was unbelievable. These people care about details, gave me attentive, personal service, and the price was competitive. If you need something a little more complicated than single-vision glasses, this is definitely the place to go. Highly recommended. Best optical I have ever gotten glasses from. I will definitely be coming back!! They have a beautiful selection of frames that are high quality, especially their Meyrowitz frames. The environment is very nice and friendly, and they provide you with the highest professionalism I have ever experienced. They definitely know what they're doing!! I highly recommend this place. The staff is very knowledgeable. The atmosphere is very friendly. © Optometrist Website Design All Rights Reserved.